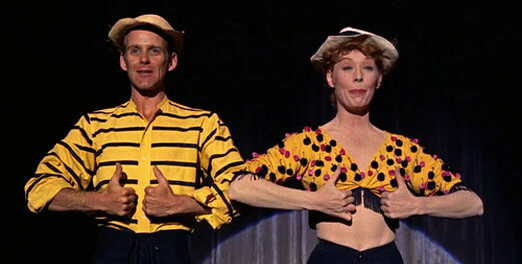 Triple-crown award-winning Broadway/Hollywood director/choreographer Bob Fosse and his four-time Tony Award-winning muse Gwen Verdon forged a bond onstage and off like few other couples in show business history over the course of their long and storied careers. Closely collaborating on such momentous musical properties as CHICAGO, DAMN YANKEES and SWEET CHARITY during their decades working alongside one another, perhaps never before or since has a master and a muse scaled the heights of success to the degree that these two undoubtedly did. Beginning in 1955 with the mega-hit musical comedy DAMN YANKEES, the pair established a simpatico supremely expressed both onstage and off, remaining collaborators, friends and lovers all the way to Fosse's death in 1987. Their celebrated work together is perhaps most vividly depicted in the thinly-veiled bio-musical masterpiece ALL THAT JAZZ, with Roy Scheider and Leland Palmer effortlessly evoking their wholly unique rapport. Now, their idiosyncratic story sashays to the small screen in the new FX miniseries FOSSE/VERDON, set to premiere on the cable network next year. Led by newly crowned Academy Award winner Sam Rockwell as Fosse, recent CABARET leading lady Michelle Williams steps into the shoes of Verdon along with a spate of familiar faces from the stage and screen in the biomusical series based on Sam Wasson's treasured tome FOSSE. Joining Rockwell and Williams will be Tony Award winner Norbert Leo Butz as Paddy Cheyefsky, Margaret Qualley as Ann Reinking, Kelli Barrett as Liza Minnelli, Ethan Slater as Joel Grey and Laura Osnes as Shirley MacLaine, with the cast rounded out by Paul Reiser as Cy Feuer, Evan Handler as Hal Prince, Susan Misner as Joan McCracken, Bianca Marroquin as Chita Rivera, Nate Corddry as Neil Simon, Aya Cash as Joan Simon, Byron Jennings as George Abbott and Rick Holmes as Fred Weaver. Steven Levenson will serve as showrunner, with an executive producer team including Levenson, Rockwell, Williams, Lin-Manuel Miranda, George Stelzner and Thomas Kail, who will also direct the pilot episode. Depicting a dynamic duo of such revered renown on the small screen is certainly no small challenge, but with a corps packed with such high-wattage talent as has been assembled for this must-see TV event it seems likely that FOSSE/VERDON will likely be an entertainment extravaganza packed with all the essential elements to delight Broadway babies around the world when it premieres in 2019... and all that jazz.